Budfoot is back in the shop just in time for 4/20! I’m going to keep the stock on these unlimited for a good long while, maybe until 4/20/2020 or maybe longer. Haven’t decided yet. But needless to say, you’ll have plenty of time to stock up on your bud, and at an affordable price of $85 each. Stands at 12 inches tall, comes with removable bong accessory, and glows under a black light. Bagged and tagged with header art + the first 25 orders come with a free Budfoot enamel pin! This Saturday a lottery will be held for a painted micro-run release of my Hag Defender squeak toy in a "Pinkleberry" colorway. This meticulously painted squishy vinyl squeak toy serves as a companion piece to the original first-ever-colorway of my Queen Hagopuss, way back when it was a resin figurine before I even got into soft vinyl. Cast in purple soft vinyl with airbrushed and hand-painted details, this squeak toy stands at 5.5 inches tall and has 3 faces. $180 + Shipping (USA is close to $15. International is somewhere around $30 or $50 depending on country). To enter the free raffle, click the "LOTTERY OPEN" ticket at the top of the home page and complete the online form This Saturday 3/30/19 at 6 PM ET. The 24 hour lottery closes Sunday 3/31/19 at 6:00 PM ET. The winners will be chosen randomly by Sympreini LIVE at 9 PM Eastern that same Sunday via Instagram Live @wondergoblin, and email notifications containing the private shop link will be issued shortly thereafter. Fungoid Man "Day Tripper Edition"
Prepare yourself for the long awaited return of the FUNGOID MAN, this time in sofubi. This will be the first soft vinyl painted edition, super limited to only 7 pieces. The toy was designed by Skinner and myself a while back, and was originally cast in resin. We decided to give him legs, so I resculpted some things and created the prototype myself in wax, then we sent it off to Japan to be molded. This edition was cast in GID soft vinyl by Science Patrol in Japan, and I painted them with black light reactive vinyl paints. The third annual KAIJU CULT is coming up soon! 4/20 from 7 PM to Midnight at Little Tree Art Studios here in Atlanta, GA. We’ve got amazing toy artists from all over the world and killer local ATL talent showcasing original paintings! We’ll have some old kaiju flicks playing off the projector, plus a special private screening of my new short film “BUDFOOT” starring Skinner as a deranged toymaker and Henry Zebrowski as the voice of Budfoot. We’re also bringing live music into the mix this year, such as Shane Morton’s transvestite viking metal band Valkyrie + more to be announced. So come hang out, have some fun, and buy some cool monster toys! 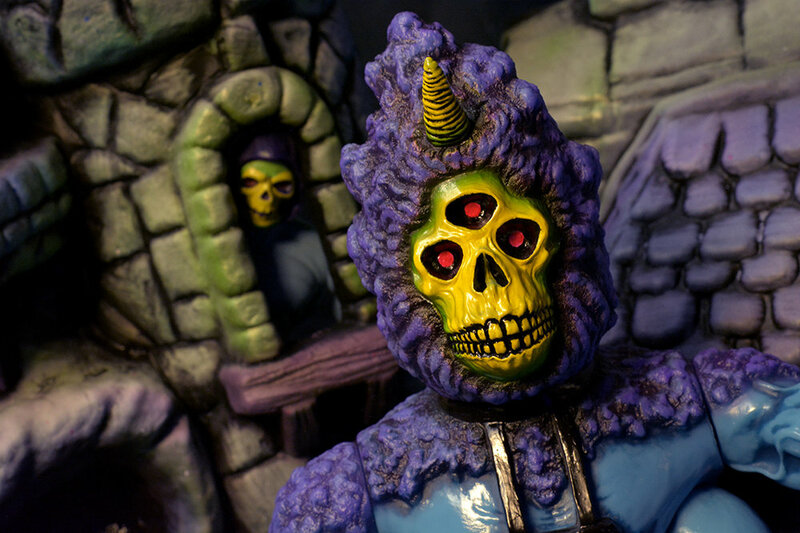 My BUDFOOT has chosen to cosmically mesh it’s atoms with the mighty DOOMKOPF by Blitzkrieg Toys, thus forming into the WEEDY WIZARD. Weedy Wizard is cast in GID soft vinyl, painted in black light reactive vinyl paints, articulated at 9 points, stands at almost 13 inches tall, and comes with Nugfoot omake and removable bong accessory. Lottery for this micro-run will be opening up at 6 PM Eastern Time this Saturday, February 16, 2019. $250 + Shipping (USA is close to $15. International is somewhere around $40 or $50 depending on country). To enter the free raffle, click the "LOTTERY OPEN" ticket at the top of the home page and complete the online form This Saturday 2/16/19 at 6 PM ET. The 24 hour lottery closes Sunday 2/17/19 at 6:00 PM ET. The winners will be chosen randomly by Sympreini LIVE at 9 PM Eastern that same Sunday via Instagram Live @wondergoblin, and email notifications containing the private shop link will be issued shortly thereafter. Remjie and Wonder Goblin bring you another DORO collaboration! "Cataract" Doro will be going up for lottery this Saturday the 19th! Figure was originally designed and sculpted by Remjie. I went in and sculpted on a few extra additional features and painted them with a combination of vinyl and urethane paints. $250 + Shipping (USA is close to $15. International is somewhere around $40 or $50 depending on country). To enter the free raffle, click the "LOTTERY OPEN" ticket at the top of the home page and complete the online form This Saturday 1/19/19 at 6 PM ET. The 24 hour lottery closes Sunday 1/20/19 at 6:00 PM ET. The winners will be chosen randomly by Sympreini LIVE at 9 PM Eastern that same Sunday, and email notifications containing the private shop link will be issued shortly thereafter. Thank you, and I hope this week treats you all well! Happy New Year everyone! In order to keep things fun and interesting, I figured it was time for a change in how things are run here at the Wonder Goblin workshop. I've come up with a new and original idea for running my lotteries in a more interactive method. Meet the great SYMPREINI, a lottery number picking machine I customized. Instead of your name getting picked randomly out of a hat or with an online random name picker, you'll get to choose a number between 1 and 59. Sympreini will then choose the lucky winning numbers LIVE @wondergoblin on Instagram before your eyes, along with only ONE lucky Golden Ticket winner per lotto release. Emails will still go out to all winners, just in case you missed the live stream, so don't worry, this new picking method won't make it any harder for the customer. So how will Wonder Goblin be starting the new year off? With HAG DEFENDERS, that's how! The Hag Defender hasn't gotten a lot of love since it's first release last year, so I wanted to start 2019 off with a bang and present to you the "PURPLE PEOPLE EATER" colorway. This meticulously painted squishy vinyl squeak toy serves as a companion piece to the Queen Hagopuss released in a matching colorway from last year's Five Points Fest. Cast in purple soft vinyl with airbrushed and hand-painted details, this squeak toy stands at 5.5 inches tall and has 3 faces. $180 + Shipping (USA is close to $15. International is somewhere around $40 or $50 depending on country). To enter the free raffle, click the "LOTTERY OPEN" ticket at the top of the home page and complete the online form Next Saturday 1/12/18 at 6 PM ET. The 24 hour lottery closes Sunday 1/13/18 at 6:00 PM ET. The winners will be chosen randomly by Sympreini LIVE at 9 PM Eastern that same Sunday, and email notifications containing the private shop link will be issued shortly thereafter. If chosen, payment must be paid within 24 hours of notification. After 24 hours, winner's link will expire and be passed on to the next random winner in line. Any winner refusing to pay by set deadline will be excluded from all future lotteries because it holds up the process for everyone, and to be completely frank, it is quite annoying. Figures will ship out USPS Priority within a week of payment. HUGE THANKS to everyone who purchased something from me in 2018. Your support for my art is what keeps me going and allows me to do this full time, and I appreciate it more than you'll ever know. Much love to all of you, and best wishes for the new year! This Saturday 12/8/18 at 11 AM ET will be the X-Mas Goto-San painted Queen Hagopuss lottery! $150 plus shipping. Not only is this the last thing I’ll be selling this year, but this will probably be the last Queen Hagopuss run I do for a LONG time. She’s been busy this year, and she told me that she could use a break, so I’m giving her 2019 off. If you want a Queen in your collection, this may be your last chance. Happy Holidays! 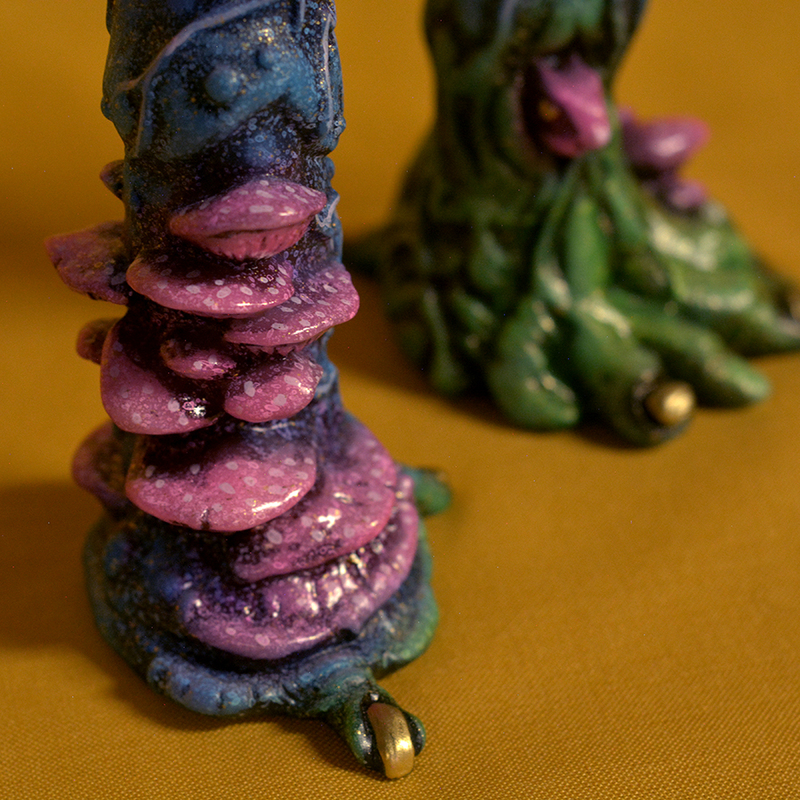 * 2 Budfoot releases - "Yeti" and "Yeti Kush" one is painted and the other is flocked. $300 for Yeti. $350 for Yeti Kush. 12 inches tall. Each run is limited to 7 pieces. 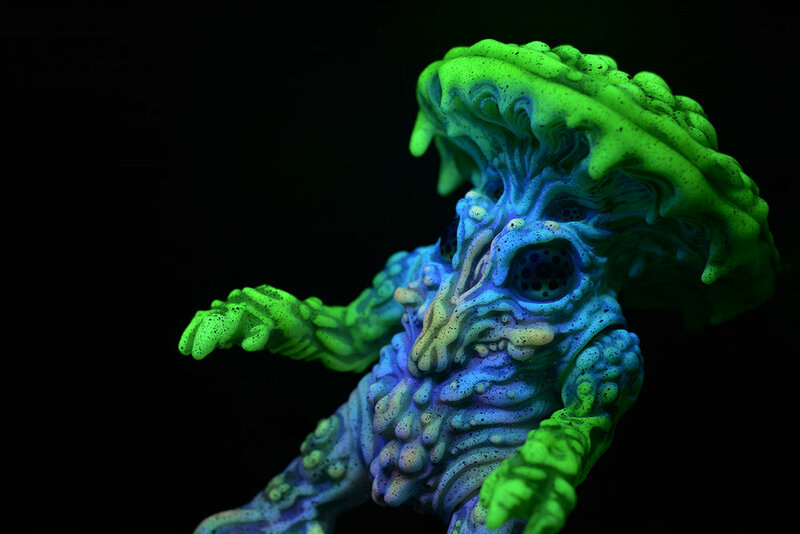 * Fungoid Man "Marbled Watermelon" (SATURDAY ONLY) release limited to 24 pieces. This will be the first soft vinyl Fungoid Man sold within the USA! Collab with Skinner and produced by Science Patrol! $150 each. * Windigo "Night Tripper" release limited to 8 pieces, 3 of which will have special dread hair attached. $350 with hair. $300 without hair. 13 inches tall. Painted in black light reactive vinyl paint. Windigo is part of the Boogey Boys toy series produced by Grizlli Atom and myself. * Hagopuss Family - Queen + Defender + Baby. All 3 figures are sold as a set, and limited to 7 sets. Each set includes a 20 x 14 inch signed and numbered giclée print of the Hagopuss Family Portrait oil painting, printed with archival inks on cold press paper. The figures are painted in vinyl paints to match the fine art print! $450 for the whole set. I'll have a few other surprises as well along with some collabs with Candie, but I haven't finished them yet, so I'm hesitant to announce details. Follow me on instagram if you haven't already to get more updates on all this. Hope to see you there! In the spirit of my favorite Holiday, I've decided to do an affordable and simple Queen release! Presenting the "Black Widow" Hagopuss. Cast in black soft vinyl with painted red eyes and widow's mark on back. I feel it's a simple and clean enough design to appease both collectors and toy customizers. $95 + Shipping (USA is close to $15. International is somewhere around $40 or $50 depending on country). To enter the free raffle, click the "LOTTERY OPEN" ticket at the top of the home page and complete the online form this Saturday 10/20/18 at 11 AM ET. The 12 hour lottery closes 10/20/18 at 11:00 PM ET. The winners will be drawn randomly with an online random name picker and notified via their email with a private shop link. Lottery entries that didn't get selected will not be notified. If chosen, payment must be paid within 24 hours of notification. After 24 hours, winner's link will expire and be passed on to the next random winner in line. Any winner refusing to pay by set deadline will be excluded from all future lotteries because it holds up the process for everyone and can be quite annoying. Figures will ship out USPS Priority within a week of payment. PLEASE NOTE: My figure runs are extremely limited, and there are more collectors than there are toys, so this is the reasoning for a toy lottery. Wonder Goblin holds raffles to make it fair for everyone wishing to collect a WG piece. Shop drops are fun, but it can be tricky for collectors who either have to work or are in different time zones to snag a piece in time. With a lottery, everyone has the same chance percentage. All Wonder Goblin lotteries are free to enter. Only the entries selected by the random name picker will be expected to pay. Thank you! We had an amazing night at Kaiju Cult this year where my Custom Hagopuss Show displayed 25 different artist’s interpretation of my Hagopuss figures! I plan to make a gallery page for these beauties soon, but until then, you can view what hasn’t sold yet in my SHOP for a limited time! Huge thanks to all the artists that participated. The one pictured above was custom sculpted by Jay222 and painted by me. Collab with AWESOME TOY! Presenting Rainbow Mothman, Yeti Mothman, and Swamp Mothman! These one-off soft vinyl cuties were created by Awesome Toy and customized/painted by Wonder Goblin. 7 inches tall and articulated at 4 points, these guys are dropping in the shop 9/9/18 at 11 AM EDT for $250 each + shipping. One per person please! Thanks! The long awaited Hag Defender is finally here in squishy soft vinyl, and I've decided to release my first painted run in a "Martian Sunset" colorway. This colorway is based off the paint job I did on my first ever vinyl test pull for my Queen Hagopuss. Each Hag Defender has 3 faces, sits at 5.5 inches tall, and is articulated at 6 points. $180 + Shipping (USA is close to $14. International is between $40 and $50 depending on country). To enter the raffle, click the "LOTTERY OPEN" ticket at the top of the home page and complete the online form. 12 hour lottery starts 9/2/18 at 11:00 AM EDT and closes 9/2/18 at 11:00 PM EDT. The winners will be drawn randomly from all entries and notified via their email with a private shop link. Lottery entries not chosen will not be notified. If chosen, payment must be paid within 24 hours of notification. After 24 hours, winner's link will expire and be passed on to the next random winner in line. Any winner refusing to pay by set deadline will be excluded from all future lotteries. Figures will ship out USPS Priority within the week. PLEASE NOTE: My figure runs are extremely limited, and there are more collectors than there are toys, so this is the reasoning for a toy lottery. Wonder Goblin holds raffles to make it fair for everyone wishing to collect a WG piece. Shop drops are fun, but generally the ones with the fastest internet connection are the ones to snag a piece. With a lottery, everyone has the same chance percentage. All Wonder Goblin lotteries are free to enter. Only the entries selected by the random name picker will be expected to pay. Thank you. Presenting EL CUCO, the first of the BOOGEY BOYS, a new toyline centered on legendary boogeymen brought to you by the collaborative efforts of Wonder Goblin and Grizlli Atom. El Cuco is designed and produced by Grizlli Atom and Wonder Goblin. It was hand-sculpted and painted by Wonder Goblin. Cast in glow-in-the-dark soft vinyl, this beast stands at 12 inches tall, and articulates at 8 points. These "Day Tripper" Cuco are painted in blacklight reactive vinyl paint, and each one comes with a WG Golden Ticket! El Cuco is a boogeyman from Latin America that has acquired a taste for misbehaved children. His many eyes watch you from the rooftops, carefully observing for any misconduct. He scoops up the bad eggs with his claw hand and devours them whole, imprisoning their spirit within his cursed entrails! Better play nice! This will be sold via lottery on 7/29/18 at 11 AM EST - $300 + Shipping (USA is close to $14. International is between $40 and $50 depending on country). To enter the free raffle, click the "LOTTERY OPEN" ticket during the above date and time at the top of the Wonder Goblin home page and complete the online form. 12 hour lottery closes 7/29/18 at 11:00 PM EST. The winners will be drawn randomly from all entries and notified via their email with a private shop link. Lottery entries not chosen will not be notified. If chosen, payment must be paid within 24 hours of notification. After 24 hours, winner's link will expire and be passed on to the next random winner in line. Any winner refusing to pay by set deadline will be excluded from all future lotteries. Thank you for understanding! I'm very excited to bring to you Splurrt's Masterworks Cadaver Kid in my signature "Swamp" flocked colorway! The original Cadaver Kid was released during a time when horror toys weren't really a thing within the sofubi community. Since it's release, a boom in horror toys ushered in. Needless to say, I'm very honored to collaborate with Splurrt on this upscaled version of a character that changed the face of the designer toy scene. This will be sold via lottery on 7/14/18 at 11 AM EST - $250 + Shipping (USA is close to $14. International is between $40 and $50 depending on country). To enter the free raffle, click the "LOTTERY OPEN" ticket during the above date and time at the top of the Wonder Goblin home page and complete the online form. 12 hour lottery closes 7/14/18 at 11:00 PM EST. The winners will be drawn randomly from all entries and notified via their email with a private shop link. Lottery entries not chosen will not be notified. If chosen, payment must be paid within 24 hours of notification. After 24 hours, winner's link will expire and be passed on to the next random winner in line. Any winner refusing to pay by set deadline will be excluded from all future lotteries. Glow In The Dark Budfoot Enamel Pins are up in the SHOP. This Glow-Green "Sativa" colorway is limited edition of 75. Comes with secure rubber backings, not those flimsy metal shits. And in case you were wondering, yes, The wearer of this pin shall be possessed with the ability to out-smoke all their friends! This Sunday, 7/1/18 starting at 11 AM EST - Glow in the Dark BUDFOOT 24 Hour Pre-Order! $125 Each + Shipping. Budfoots stand 12 inches tall and articulate at 6 points. Numbered, bagged, and tagged with Header Art. Comes with bong accessory. Thank you! Toyboom x Wonder Goblin - Crukii and Kimo - Tomorrow, Sunday 6/24/18 at 12 Noon EST - Dropping in the Wonder Goblin web shop. Created by Toyboom and painted by yours truly in black light reactive vinyl paints. Kimo bags crocheted by @Meowzaboo. Bagged 'n' tagged with header art. Limited to only 7 pieces. $250 plus shipping. Collab with Choke Hazrd! These two Toxic Cyclops will be going up for an 8 hour lottery Sunday 5/27/18 at 10 AM EDT. Toxic Cyclops stands at 5.5 inches, articulates at 3 points, and is painted with black light reactive vinyl paints. $160 + Shipping. To enter the free raffle, click the "LOTTERY OPEN" ticket at the top of the home page during lottery play hours and complete the online form. Winners will be drawn randomly from all entries and notified via their email with a private shop link. Lottery entries not chosen will not be notified. NOTE FOR NEWBIE COLLECTORS: Though it may seem obvious to most of you, please understand this is not a giveaway. If chosen, payment must be paid within 24 hours of notification. After 24 hours, winner's link will expire and be passed on to the next random winner in line. Any winner refusing to pay by set deadline will be excluded from all future lotteries. Wonder Goblin is going to Five Points Fest, June 2-3 at the Brooklyn Expo Center in NY, Booth #339! Exclusive soft vinyl figures I'll be bringing with me will be Budfoot "Skeletor OG" limited to 9 pieces at $300, and Queen Hagopuss "Purple People Eater" limited to 7 pieces also at $300. The Budfoots stand at 12 inches tall and articulate at 6 points, and the Hags are 9 inches tall, articulating at 7 points. I'll be bringing some other surprises too, but you'll have to come see me for those! Tickets are on sale at fivepointsfest.com so hit them up if you're in the area or feel like taking a vacation to New York. It's going to be a fun festival!